Jonesing for Simplicity - Jill Ruth & Co.
And, this is pretty simple. Jones soda (occasional treat for kids) = vases for me. Filled with just a few easy to grow blanket flowers and it's lovely. The mosaic...not so easy, but I'm learning! Linking up with Mary at the Little Red House. Ok, I know "jonesing for simplicity" is a little extreme, but I just had to use the word play, thanks for not rolling your eyes. You didn't, did you?! I did....of course I did! Love it Jill! Simple Chic! love the B&W graphics with the colorful flowers! 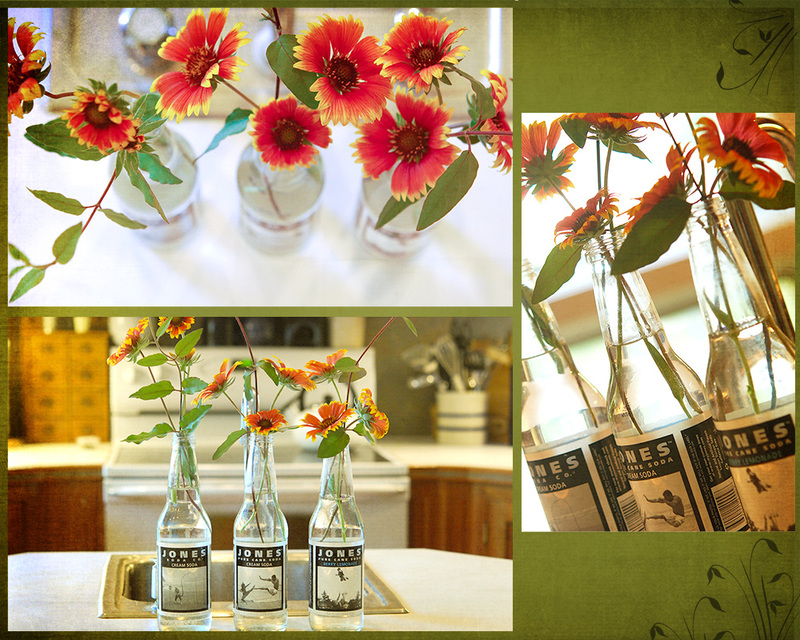 The Easter bunny tends to bring Jones' soda in the kid's baskets every year - love your vase idea! Cute as always! A very good way to show case the beautiful flowers. No I thought it was pretty clever. Love your mosiac. I haven't done one in so long. I think I forgot how. Love the shots and the angles. I need to get out more----never heard of the stuff!! Love your mosaic! You did a great job! great composition!